SAN DIEGO—While most passionate boaters want to spend as much time as possible on our boats, life and work requirements often interfere, despite our best desires and intentions. That’s what happened to us this year. Because of a prolonged renovation project at our condo and several other unavoidable matters, Arv and I weren’t able to enjoy our boat as much as usual – and Arv wasn’t able to perform all the routine maintenance tasks he normally does. Every January we need to vacate our slip for the Sunroad San Diego Boat Show, which enables us to experience other marinas. But as Arv began preparations to move Burgundy various problems showed up with a vengeance, as generally occurs whenever a boat’s systems aren’t exercised regularly. Despite starting the engines periodically, this time he couldn’t start them. He suspected a failure of the batteries used to start the engines. 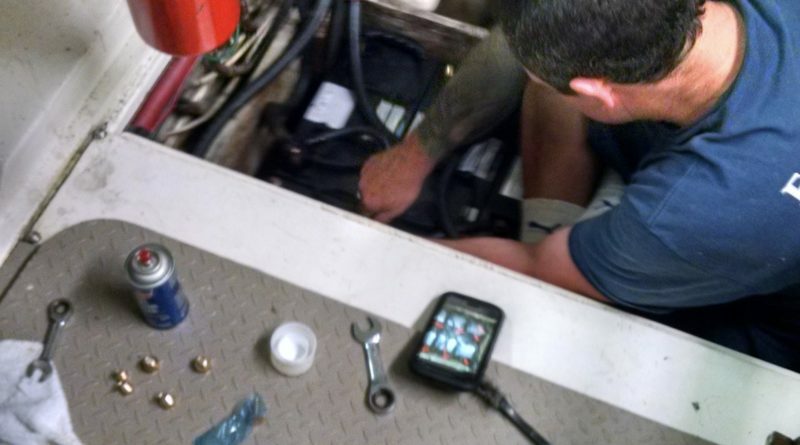 When he looked up his maintenance records – he notes the date and type of work he’s undertaken – he realized the batteries, which he’d replaced soon after we bought the boat, were more than nine years old. He learned that AGM batteries, newly available on the market when he purchased them, have an expected life of eight to 10 years. Bingo! He identified a local company, which had four in stock they could deliver and install quickly. One problem solved. Next he discovered a problem with the steering and correctly diagnosed a slow hydraulic fluid leak. Replenishing the fluid and recharging the system solved the problem until he has enough time to chase down the leak. What other things can go wrong when you’re away from your boat and not using and inspecting its systems regularly? Here is a small sampling. In the harsh marine environment battery terminals and metal connectors corrode and plastic plumbing connectors fracture or loosen. Electrical wires grow brittle and plumbing and engine hoses lose their elasticity with age. Both crack and break and typically fail at connectors. It’s critical to check both your electrical and plumbing systems regularly – and especially if you’ve been away a while. The best way to identify any of these problems is by exercising these systems, even if only briefly during short visits – or ask a boat maintenance service technician periodically check up on them if you can’t get to the boat. For electrical systems, electrical engineer Arv explained to me, you might experience a drop in voltage or no voltage at all. That’s a sign that an electrical wire has broken or connectors have corroded somewhere in your boat. You won’t know there’s a problem unless you activate the system. A slow leak in water or hydraulic systems can cause unexpected fluid in the bilge. If it’s a serious leak you may notice your boat is sitting lower in the water than normal or display a distinct list to port or starboard. You may hear a constantly cycling bilge pump. Remember: your bilge should be dry or have only a trace of water in it. Any more is a sign of a problem. Bilge pumps also fail through contamination, including “gunk” building up on the float, corrosion or age. The float, which senses the bilge’s water level, and connectors in the pump can corrode and the pump’s impeller, made of a rubber-like material, hardens and breaks with age. All boats, even when new, require regular maintenance. The best way to avoid inopportune maintenance problems is to exercise its systems regularly. And some failures appear only when the boat is underway. So, yes, I’m giving you an excuse to go boating! ← What services can boaters expect during the government shutdown?